The dream begins. Can you tell we're ready? Thanks to Grandma for the box of flag shirts that arrived just in time for the first kick! 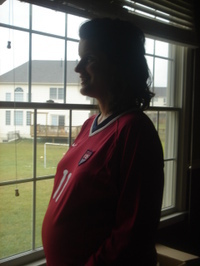 And I'm betting Bobby never imagined that National Team jerseys he left behind would become cutting edge maternity wear! 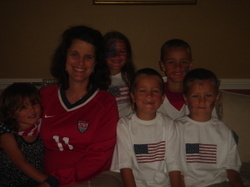 (Note to viewers at home: Bobby was number 11 on the U-17 National Team, back when he was Michael's age; now he's number 15.) And yes, he's starting!!! Tony, Tony, please come 'round!